If you are searching for the best calcium supplement for your reef tank then read on. There is a reason why Seachem is the world’s leading supplier of aquarium supplies. Here will will provide you with some information relating to our reef supplement range, including Seachem Reef Calcium. Seachem is one of the world’s only independent pet supply companies. In business for over 30 years and now sold worldwide, our products are preferred by hobbyists the world over for their innovative features and Seachem Reef Calcium is no exception. Most Seachem products are completely unique to the brand, developed by our dedicated team of scientists. Seachem Reef Calcium is a liquid organic calcium source designed to maintain calcium levels in your tank and to accelerate coral growth. It does this by making the maximum amount of calcium available for coral to absorb. Seachem Reef Calcium utilises chained organic calcium rather than an ionic calcium. This form of calcium is absorbed and utilized easily by the coral, with minimal energy required. On the other hand, the charged molecules in ionic calcium require a larger amount of energy to take in. Our calcium supplement allows coral to take in as much calcium through organic chains when tank calcium levels are low, as they would through ionic calcium with much higher levels required. Due to a common misconception we are often asked whether Seachem Reef Calcium contains sugars that can lead to algae growth. It absolutely does not and this product simply cannot lead to the growth of algae. 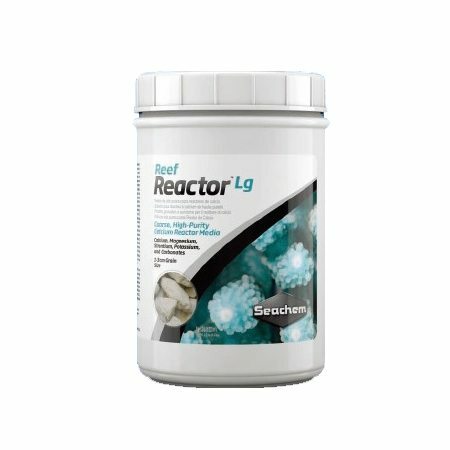 This reef supplement contains no nitrogen or phosphorus so it is biologically impossible for it to lead to algae growth. The belief that it can is based on a faulty assumption based on the premise that polyglyconate is the same as glucose. It is not. In fact, the presence of polyglyconate can even have the beneficial side effect of lowering nitrate levels in your tank if they are too high, because corals, as well as your biological filter, can break it down and use it as a carbon source. Reef Calcium can be used alone but is designed to maintain, not increase, calcium levels so increased coral growth will be seen if it is used alongside one of our ionic calcium supplements – Reef Complete or Reef Advantage Calcium. Is Seachem Reef Calcium the best calcium supplement for reef tanks? Our customers certainly seem to think so. Since Seachem products offer the best value of any aquarium products on the market you have nothing to lose by giving it a go.